Email open rates aren’t amazing. We all know that. Especially when it comes to cold emails or reaching someone for the first time. 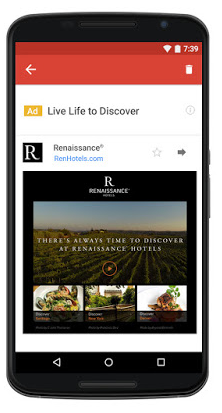 Gmail recently released native, mail-based ads directly into AdWords after beta testing them for a few years. Now you can deliver display-network-style ads directly into a user’s Gmail inbox. It allows businesses to interact and engage with users like we’ve never seen before. When you want to reach someone that you normally can’t, these ads are a perfect way to do it. They stand out from typical emails in an inbox, so if your prospect isn’t responding, these ads are a great way to drive engagement. How to run a Gmail ad campaign that generates a massive return on investment. Gmail has more than one billion monthly active users, making it an email haven for countless companies and users around the world. And now, the platform has gotten even better for advertisers. In September of 2015, Gmail introduced native ads for all AdWords advertisers on the Display Network. They worked in beta testing for multiple years with advertisers to figure out how to extend their email marketing and advertising strategies. Now they’re available for any advertiser to use, which is fantastic. These promotions tab ads come in one standard format that Gmail claims is the best in performance. From beta testing, they’ve reduced the number of ads. So, to increase your open rates, they’ll show fewer ads but make sure that they are more specifically targeted. 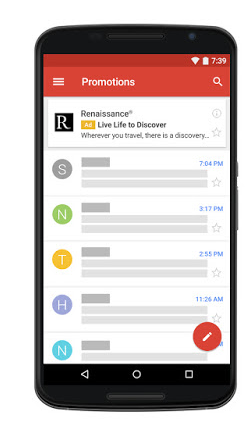 The Gmail ad will display at the top of the inbox with a yellow “Ad” label to distinguish it from the rest of the content. Advertisers looking to take advantage of these ads can choose from multiple customizable templates for the expanded portion. 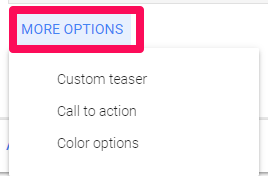 Gmail allows users to use single images, highlight promotions, use a CTA button, and even showcase multiple products or offers with the use of a single ad. For tech-savvy users, the custom HTML format offers flexibility to control your assets and create a rich experience using videos, forms, multiple links, and more. It includes multiple products and CTAs along with promotions. So, how does the audience targeting work? 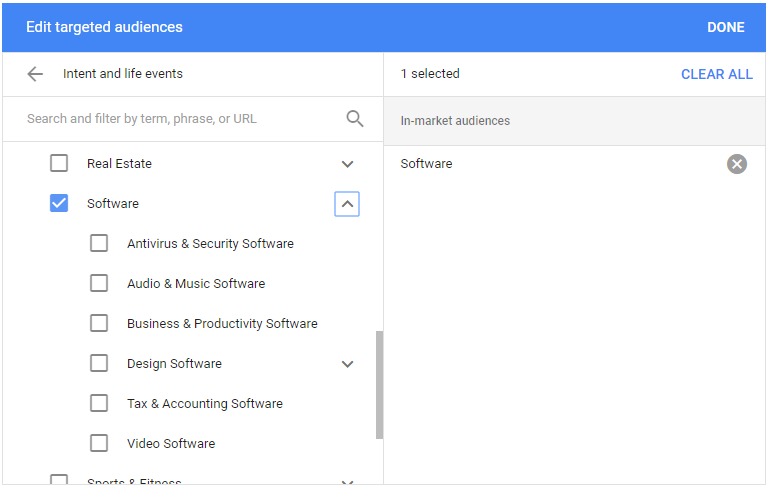 It taps into the already-existing display network tools like keywords, affinity audiences, demographics, and more. Do you sell SEO services? You can target specific topics like “content marketing” or “search engine optimization” to show your ads to relevant customers. Gmail ads are already proving to have big impacts. Renaissance Hotels has seen a 25% longer time on site and an 18% increase in pageviews per visit from their first few campaigns. Are you ready to run a high ROI Gmail ad campaign? Here’s how to set yourself up for success. 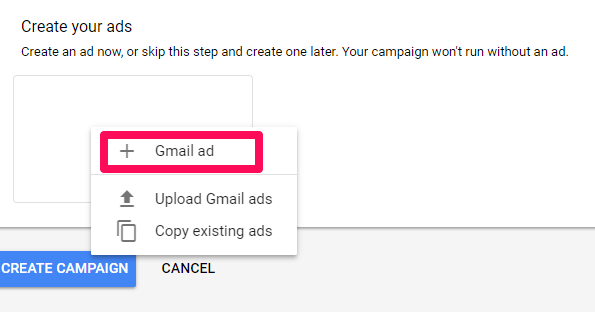 Gmail ads are extremely easy to set up right within your existing AdWords account. To get started, all you need is an active AdWords account with your credit card or payment system linked. Head to the campaigns section and create a new one. Be sure to select the display network, as this is the only network that is currently compatible with Gmail-based ads. Clicking the display network as your campaign type will bring up a few different objectives and goals. Currently, only three of the five goals on the display network will support Gmail ads. Choose one of these three ads, and you’ll notice that your campaign subtype options will change. From here, you can customize your audience just like you’d do for a standard display campaign. 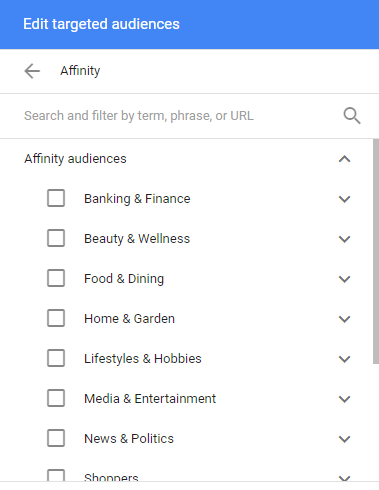 Select specific keywords or audience functions like affinity groups or intent and life events. Next, scroll down to the bottom after inputting your bidding and budget information. 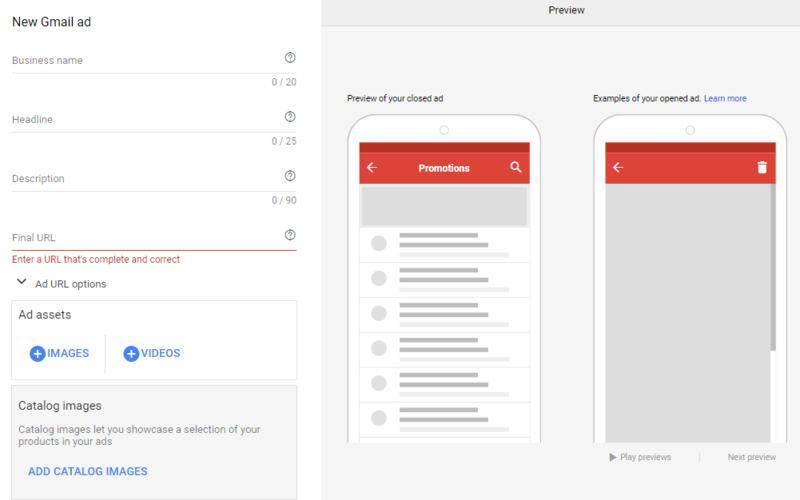 Now you can start to create a beautiful ad directly on AdWords that is optimized for both mobile and desktop experiences on Gmail. You can add your business name, a headline, a description, your landing page, and your valuable assets like images and video content. This is the main hub where you can create and edit your Gmail ads. Now that you know the basics of getting your Gmail ads going, it’s time to dive into specific ways you can produce a sky-high return on investment with this ad format. Setting up Gmail ads is the easy part. But producing a high return on investment in new mediums is tricky. Flying blind will require you to test the waters for weeks (if not months) all while draining your budget on mostly failed tactics. Here are a few ways to guarantee yourself a high ROI with Gmail ads. One of the best ways to reduce your ad spend on any platform is to improve the quality score of your ads. That’s true of the AdWords search network, display network, Facebook, and Twitter. Each platform sees a massive boost in performance with simultaneous decreases in costs when you optimize your quality score. Unfortunately for Gmail-based ads, you currently can’t see the quality score of your ads. But that doesn’t mean you can’t infer if it’s high or not. Instead, start by looking at your open rates. It’s the click-through rate from unexpanded ad to expanded ad. If it’s low, you’ll want to improve it. 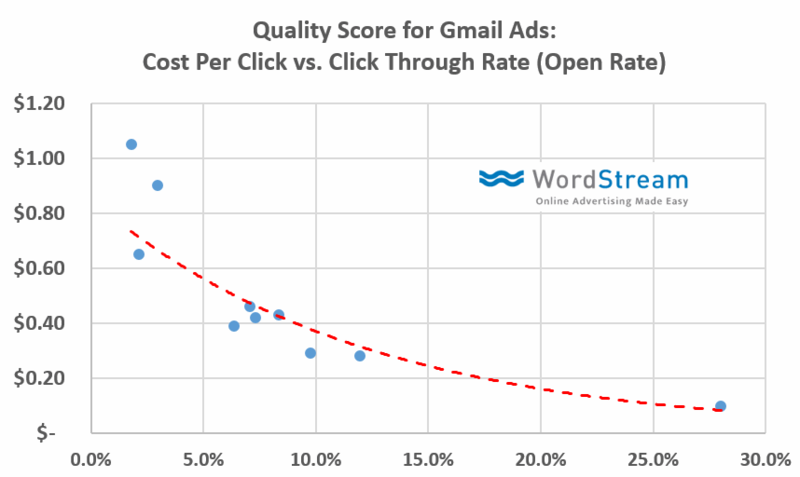 Larry Kim of WordStream conducted a study on the relationship between cost per click and click-through rate (open rate) on Gmail-based ads. The higher the click-through/open rates were, the lower the cost per click. Bad open rates? Your costs will be through the roof. Advertisers with an open rate less than 5% were seeing costs approaching or surpassing a dollar. Meanwhile, the top advertisers were paying less than 20 cents per click. The difference is shocking and can lead to huge increases or decreases in return on investment. It means that audience targeting and optimizing your offer for that audience is crucial for a high ROI. You can’t risk targeting an audience who doesn’t want what you have to offer. That’s only going to sink your ROI and deplete your budget. 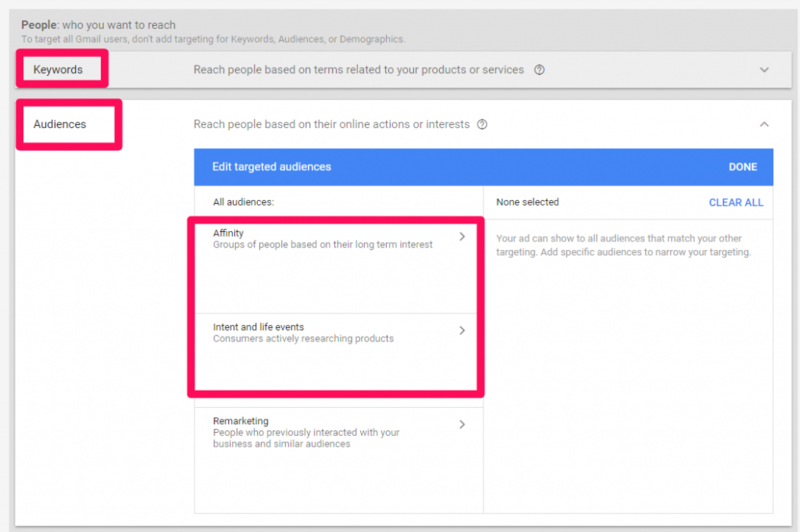 To combat this, dial in all of your audience targeting features within each ad setup on Gmail ads. For example, make sure that each audience you target gets their own customized offer that’s guaranteed to resonate with them. 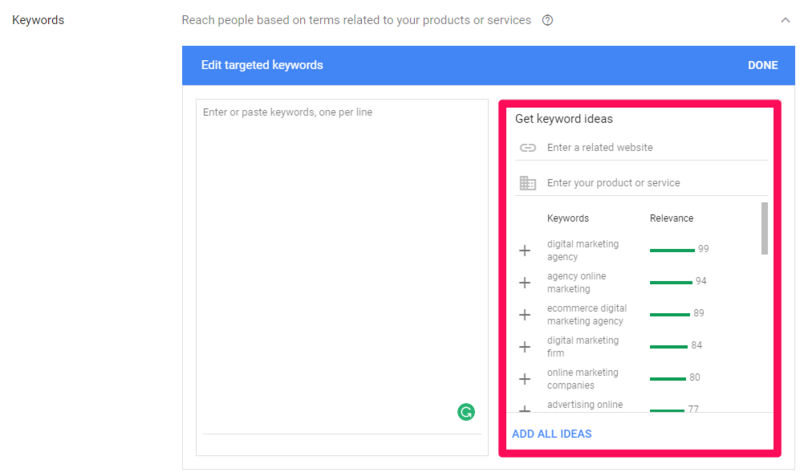 For each different ad, you’ll want to target different keyword sets. This way you can get as specific as possible with each offer rather than just targeting a broad group of “marketing” related users. Affinity groups will narrow down your audience to only include users who have dedicated interests. With Gmail ads, you can target by gender, age, parental status, and household income. For example, if you sell a product geared toward parents, you can eliminate tons of non-parents with a simple click. Household income allows you to only target audiences who are most likely (or able) to buy from you. Remember: bigger isn’t always better. Having a massive 1,000,000-user audience might sound amazing, but if your product is specific, it’s not. You want a smaller, targeted list of users who will open your ads at high rates and drive your cost per click down. Chances are, you’ve already conducted some form of email marketing. So even if you haven’t created a specific Gmail ad before, you likely have experience with email-based campaigns. Odds are, email marketing is a commonplace tactic for you. Meaning you have an idea of what works and what gets you a 0.001% open rate. A great way to increase your open rate is to follow those same practices. Depending on which analytics software you use, you can analyze which email campaigns have performed best. Maybe you even recall what they were. Simply take those existing subject lines and the content within the body of those emails and use them for your next Gmail ad! You can place the subject line as your new headline to grab attention from users fast. What worked for you on regular email marketing campaigns can carry over well to Gmail ads. With any new advertising platform comes confusion. You’ll never know what works for your audience until you try it. Thankfully, cost per clicks on Gmail are relatively cheap in comparison to typical search network costs. Most advertisers aren’t paying 20 or 30 bucks a click. Most are paying just a few bucks or less. Meaning you can run a few small-scale tests and double down on the ones that show promise early on. Simply add a new ad to your ad group and see which ad performs best. Remember: keep the audience targeting the same here. All you want to test is specific variables like headlines and offers. See which headlines produce a better open rate. 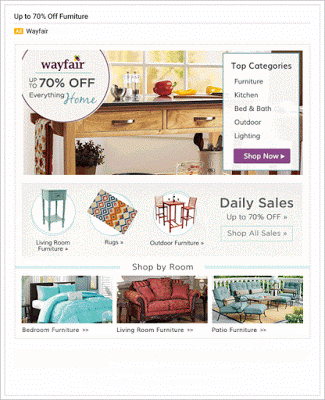 Or, conduct a test to see if coupons and sales-based offers resonate better with your audience. Always be sure to test one specific variable at a time to pinpoint what changes are causing increases or decreases in your sales. Testing is the key to producing a high performing, ROI-generating Gmail ad campaign. Reaching customers via email is becoming harder and harder. Inboxes are more cluttered than ever, and people are getting more emails than ever before. But you still need to reach those prospects if you have any hopes of growing your business. With new Gmail-based ads, you can now target your ideal customers with ads directly in their inboxes. Instead of getting lost in the sea of emails, your ad will display at the top of the inbox, giving you diverse options for converting traffic. You can include diverse elements like video, product sales and customizable calls to action. When implementing Gmail ads, work to improve your ROI by refining your audience targeting and boosting your open rate. Take what you’ve learned from your previous successful email marketing campaigns and put it into practice here. 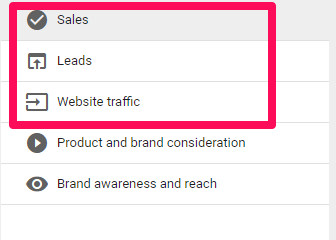 To produce the best ROI possible with Gmail ads, you need to focus on driving your open rates higher. If you put these pointers into practice, you can run a successful Gmail ad campaign that yields a high ROI.